It is just like a security guard who works for you 24 hours and 7 days a week, non-sleeping, and no salary needed. 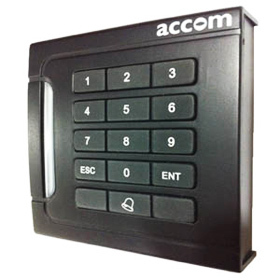 Now, our authorized dealers provide this "security guard" for you a Card Access System with EM-Lock inclusive of installation. This is valid for installation in the Klang Valley, Malaysia. 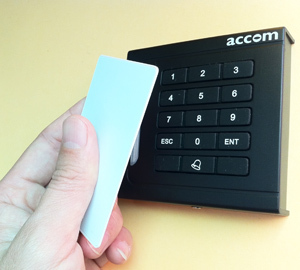 Card Access System with 1600 users + Installation + One-year Warranty. Card Access System with support up to 1600 users. EM Lock with 600lbs power. 10 pieces of RFID Proximity Cards. Includes consultation, installation, and system training. Valid for single leaf grill door, metal door, wooden door, wooden glass door, aluminum door or aluminum glass door. Additional RM50 for temper glass door. A minimum 5mm gap required between temper glass door and door frame is required. Additional RM50 for temper glass door frame (top). A minimum 10mm gap required between temper glass door and temper glass door frame is required. The Exit button shall be installed beside the door. A power point shall be installed by the client before the installation is conducted. The workmanship for wiring, system installation and training shall be conducted within one working day. Installation premises in Klang Valley. Our authorized dealers reserve the rights to impose any additional surcharge if the installation conditions are different from the above or any special arrangement needed due to customer's requirement. Call any of our authorized dealers for enquiries, site visit and quotation. Confirmation of your purchase and deposit payment. Confirmation on the workmanship appointment schedule. You will receive calls from the dealer or their representative prior to appointment. (The dealer reserves the right to reschedule if the customer is unreachable). The workmanship requires one working day for Wiring, Installation and Training. It will take place from 10:00 a.m. – 5:30 p.m. on agreed date (Mon - Sat, including selected public holidays). You shall pay the final payment during the installation. For warranty claims, call our authorized dealer for further information. Enquiries: Please call any of our authorized dealers (Call Mon – Sat: 10:00 a.m. – 5:30 p.m.). Click here for full product specification and features. Protect belongings from unwanted visitors with card access systems powered by 600lbs Electromagnetic Lock. Control the flow of the staffs with the proximity cards that assigned to different standalone card access controllers. Safety gurus provide consultation, installation, and system training to clear confusion and avoid future system overwrites by technologically stunted garden gnomes. Accomix.com © 2003-2014 by Accomix Control Sdn Bhd. All rights reserved.